With the final of the 2014 Masterchef just finished, I thought it was appropriate to post my review of 2010 Masterchef winner Dhruv Baker's new cookbook: Spice - Layers of Flavour. Dhruv Baker describes his love of spices in a well written introduction, citing his mum as the 'best cook I've ever known and has a culinary heritage that is impressive. 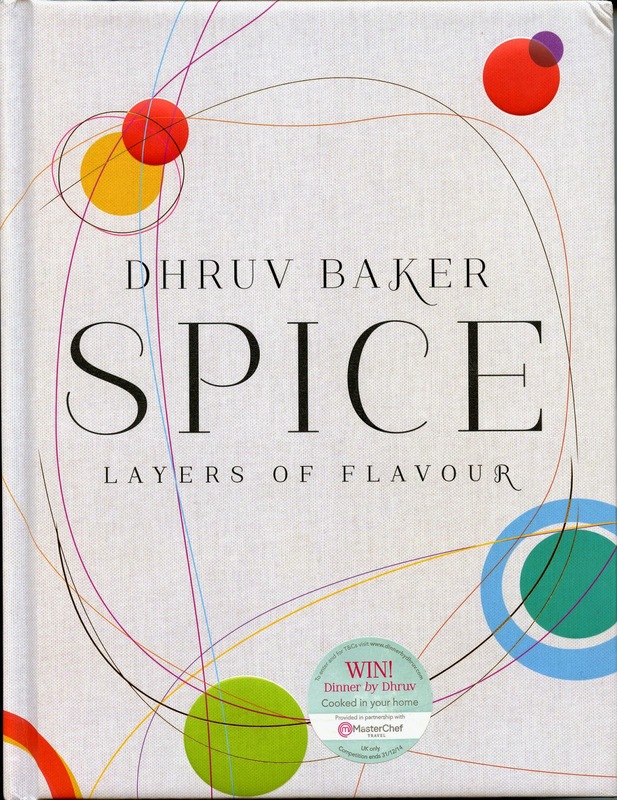 This is followed by Dhruv's Spice Philosophy and his Flavour Map, both of these are well worth reading before starting to make the recipes. Small Plates: some of the dishes that appealed to me were Butternut Squash with Red onion, Feta and Coriander, Cheese and Cumin Croquettes ooh and a recipe for Crab Cakes (see my adventures in Nova Scotia). Fish and Seafood: Wow, some fabulous dishes in this chapter, how about Garlic and Chilli Clams, Harissa Sardines, Malabar Prawn Curry and Monkfish with Chilli and Black Cardamom. Meat: features a variety of different spiced dishes includes 'The Best Spare Ribs Ever', Slow-Roasted Pork Belly with Fennel and Coriander, Lamb and Lentil Shami Kebabs and Homemade Salt Beef. 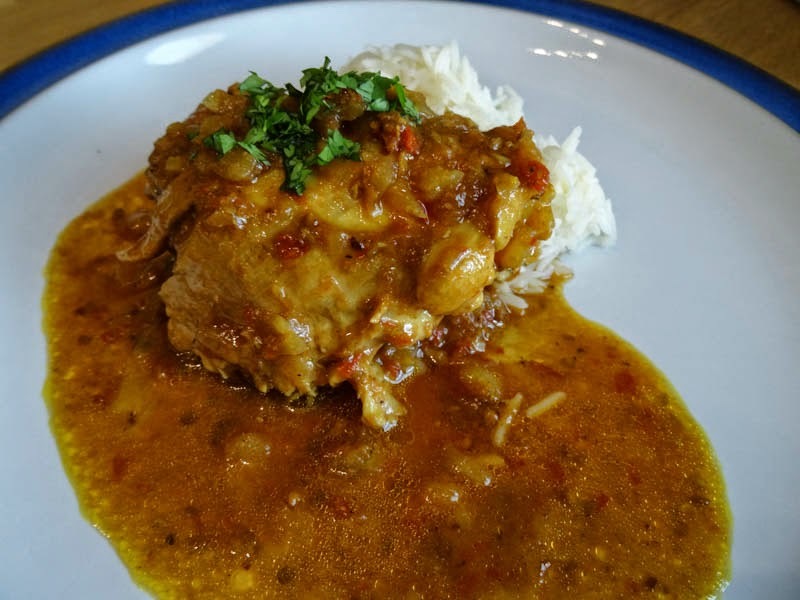 Chicken and other birds: I made the Super Simple Chicken Curry (see photo above), not only because it was straight forward but because it was the first dish that Dhruv cooked using spices, one which his mother taught him when he was 11 years old. Other recipes in this chapter include Roast Chicken with Garlic and Paprika, Turkey Mole and Achari Spiced Duck. Vegetables and Grains: this chapter takes classics and spices them up like Saffron Pommes Anna and Cauliflower Cheese with a Cumin and Macadamia Crust. Other highlights are Cumin and Chilli Potatoes, Miso and Ginger Glazed Aubergine and Cauliflower and Peas with Chilli and Coriander. Sweet: oh my, how droolworthy are these desserts? The titles alone should tempt you, I know that I am totally mesmerised by Lemon, Lime and Cardamom Tart, White Chocolate and Cardamom Mousse, Rum and Star Anise Poached Figs, Masala Chai Ice Cream with Poached Pears and Chocolate Truffles and Pistachio and Cardamom Shortbread. Something to Drink: Cheers! Pear and Prosecco Spritz, Cardamom Martini, Cinnamon & Star Anise Hot Chocolate and Masala Chai. Relishes and Accompaniments: relishes are such a great way to add to your meals, I like the look of the Kachumber, a cross between a salad and a salsa, the Plum and Black Cardamom Sauce and a tangy and sweet Tomato Relish. Unlocking the Spice Cupboard provides a comprehensive guide to spices one of the best I've read, so much information about how to use each spice, what it tastes like, examples of how to cook with it and dishes where it plays a key role. There is also information about 'The Many Ways to Use Spices' like infusing, dry roasting and making marinades and rubs. This is not a book of curries, there are some curried dishes but it is much more than that. It's a book which is accessible to pretty much anyone who likes to cook with spices. It's a well laid out book with a lot of background information to help the cook get the best from the recipes. The recipes are clearly laid out and easy to follow. There are some nice little stories from Dhruv scattered through out the book which I enjoyed reading. Many of the dishes would be for special occasions and some require a long list of ingredients, but there are also recipes which are simple and you would have the ingredients in your larder and fridge. Here is the recipe for I made from Spice, it was delicious and even better when it was reheated the next day, do try it, you won't regret it. Heat the oil in a large, lidded pan and, when hot, add the cloves, cardamom pods and cinnamon stick. Fry for about 3-4 minutes over a medium heat. Add the onions and fry for 10-15 minutes, until golden. Add the garlic and ginger and cook for a further 2 minutes then pour in the water and cook for another 5 minutes stirring constantly. Ad the blended tomatoes and cook for 10 minutes before adding the chicken pieces. Cover and cook for 5 minutes, then add the stock and cook, covered, for 10 minutes. Remove the lid, increase the heat and cook for a further 10 minutes until the chicken is cooked through and the sauce has stared to thicken up. Season to taste and sprinkle over the chopped coriander. Serve with steamed rice, naan bread and Cucumber Raita. Great book review as always and a delicious recipe too. I feel the need for a curry now! It is Ali, you can adjust the chillies to suit too. Thanks Karen, it was very good. Thanks Dom, it is sooo hard being a food blogger, looking at food all day! John and Gregg really did love Dhruv didn't they? Seems like the long wait for his book was worth it. They certainly did, Helen. I think that was the last time I watched all of Masterchef! awww how sweet! Mind you, I met him at a supper club a few weeks ago and he was quite NORMAL! Ha ha! Normal is a big compliment, Fiona. Super simple curries are a must in every ones cooking repertoire. Thanks for sharing this one Janice. Looks like a cookbook to have on my shelf. Very well written book review Janice , I like that you choose to cook the simple chicken curry , Sundays in my house are never complete without my parents standard chicken curry and jeera rice and Dhruv's memories reminds me of my happy childhood days back in Mumbai , cooking has always been so much a part of growing up for me too so I really identify with Dhruv's book , I will buy this because of the sheer variety of recipes he has managed to cover ! Kudos! Now that's a great compliment, Fiona! Thanks Bintu, especially when they are super tasty too!